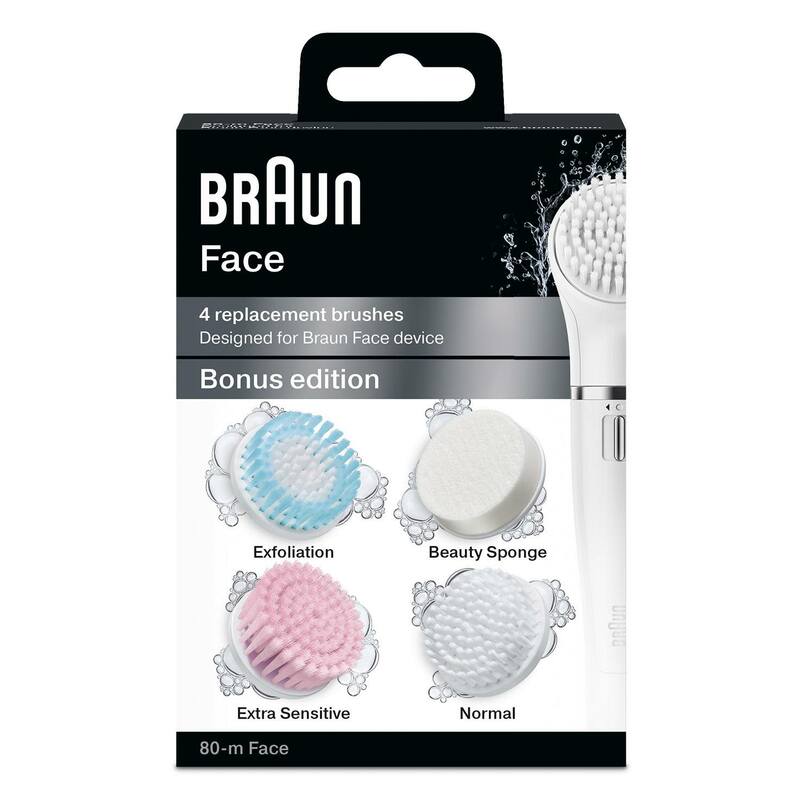 The Braun Face Bonus Edition contains all four brushes to tailor your face cleansing experience to your specific skin needs. Normal brush: removes make-up and impurities up to 6x better than manual cleansing. For daily use. Extra Sensitive brush: provides an extra gentle cleansing experience for delicate,dry and sensitive skin. For daily use. Exfoliation bush: gently yet effectively sweeps away dead skin cells to visibly refine skin. For weekly use. Beauty Sponge: helps to massage cream or serum into the skin and helps apply make-up evenly on the skin. For daily use. For optimal results and hygiene it is advised to replace the Beauty Brush head every three months. The pack contains all four brushes. For combination skin, complete and thorough skin care routine<br/> The Braun Face Bonus Edition contains all four brushes to tailor your face cleansing experience to your specific skin needs.<br/> 4 steps to flawless skin beauty:<br/> Normal brush: removes make-up and impurities up to 6x better than manual cleansing. For daily use.<br/> Extra Sensitive brush: provides an extra gentle cleansing experience for delicate,dry and sensitive skin. For daily use.<br/> Exfoliation bush: gently yet effectively sweeps away dead skin cells to visibly refine skin. For weekly use.<br/> Beauty Sponge: helps to massage cream or serum into the skin and helps apply make-up evenly on the skin. For daily use. <br> <br> For optimal results and hygiene it is advised to replace the Beauty Brush head every three months. The pack contains all four brushes.